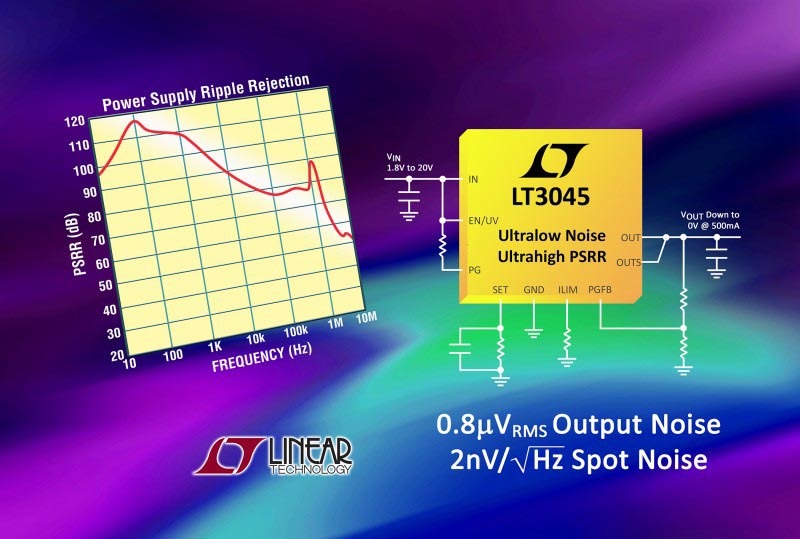 Linear Technology Corporation announces the LT3045, an ultralow noise, ultrahigh power supply ripple rejection (PSRR) low dropout voltage linear regulator, a higher output current version of the widely accepted 200 mA LT3042 ultralow noise LDO. The LT3045’s unique design features ultralow spot noise of only 2 nV/√Hz at 10 kHz and 0.8 μVRMS integrated output noise across a wide 10 Hz to 100 kHz bandwidth. Low and high frequency PSRR performance are exceptional. Low frequency PSRR exceeds 90 dB out to 10 kHz and high frequency PSRR exceeds 70 dB out to 2.5 MHz, thereby quieting noisy or high ripple input supplies. 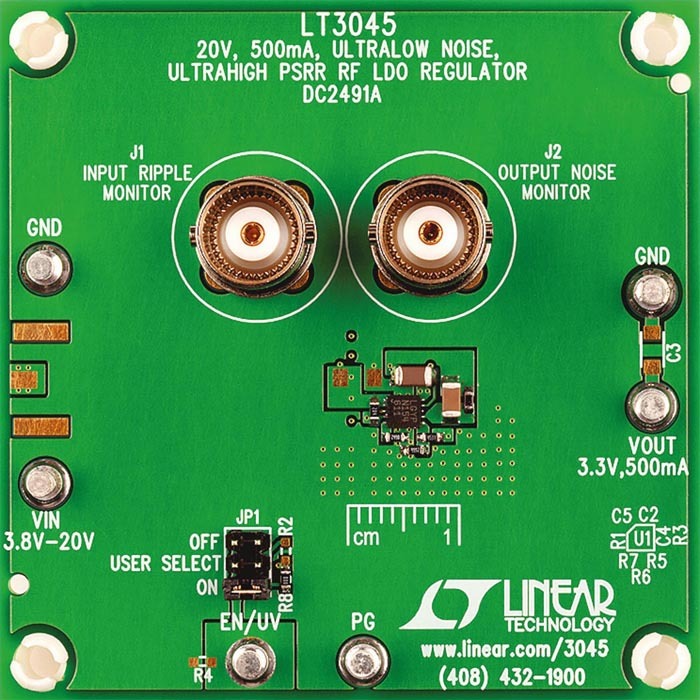 The LT3045 utilizes Linear’s proprietary LDO architecture – a precision current source reference followed by a high performance unity-gain buffer, resulting in virtually constant bandwidth, noise, PSRR and load regulation performance, independent of output voltage. In addition, this architecture permits paralleling of multiple LT3045s to further decrease noise, increase output current and spread heat on a printed circuit board. The LT3045 delivers up to 500 mA output current with a 260 mV dropout voltage at full load, across a wide 1.8 V to 20 V input voltage range. Output voltage range is 0 V to 15 V and output voltage tolerance is highly accurate at ±2% over line, load and temperature. The device’s wide input and output voltage ranges, high bandwidth, high PSRR and ultralow noise performance are ideal for powering noise-sensitive applications such as PLLs, VCOs, mixers, LNAs, very low noise instrumentation, high speed/high precision data converters, medical applications such as imaging and diagnostics, precision power supplies and as a post-regulator for switching supplies. The LT3045 operates with a small, low cost, 10 μF ceramic output capacitor, optimizing stability and transient response. A single resistor programs the external precision current limit (±10% over temperature). A single SET pin capacitor lowers output noise and provides reference soft-start functionality, preventing output voltage overshoot at turn-on. Moreover, the device’s internal protection circuitry includes reverse-battery protection, reverse-current protection, internal current limit with foldback and thermal limit with hysteresis. Other features include fast start-up capability (useful if a large value SET pin capacitor is used) and a power good flag with programmable threshold to indicate output voltage regulation. The LT3045 is available in thermally enhanced 10-lead 3 mm × 3 mm DFN (pincompatible with the LT3042) and 12-lead MSOP packages, both with a compact footprint. The E- and I-grade versions are available from stock with an operating junction temperature of –40 °C to 125 °C. A future high temperature H-grade version will be rated from –40 °C to 150 °C. Devices are in stock, priced starting at $2.80 each for the E-grade in 1,000-piece quantities. Demo circuit DC2491A with LT3045 LDO regulator.